Around here, we always have a lot of balls in the air. The Convince & Convert Consulting division provides digital business counsel to some of the world’s largest brands. And the Convince & Convert Media division provides digital advice to marketers and business owners via this blog (10 posts per week), our daily email (The One Thing), our 4 podcasts, ebooks, books, speaking and beyond. Yet, our entire team is 11 people, with nine of them half-time. And, we’re totally virtual with team members located coast-to-coast. How do we keep everything straight and the trains running on time? Well, the real secret is hiring AMAZING people, letting them do what they do, and making sure you treat them well enough that they want to stay. In our nearly seven years, we have 0% turnover. I’m pretty damn proud of that. But beyond great people, we use a bunch of technology to replace the meetings and b.s. that causes so many companies to waste time and leak effectiveness like a 1973 Gremlin dropping oil in the driveway. 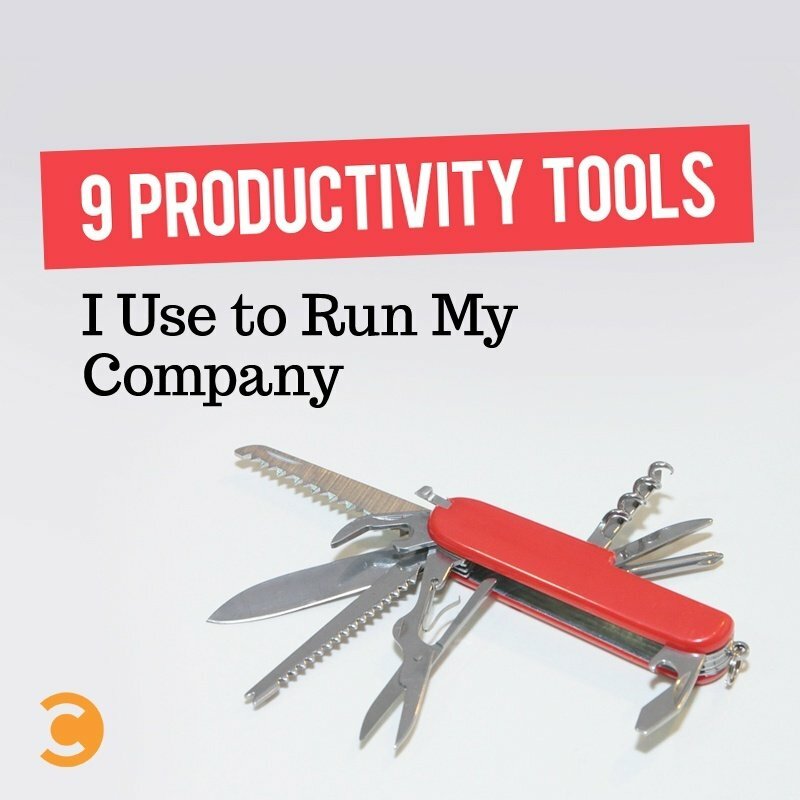 The whole list of the tools we use routinely would be a VERY long post, as we have more than 50 pieces of software in our bag of tricks, but this batch of 9 are our most important contributors in terms of team interaction and efficiency. This is probably our newest tool and has quickly become indispensable. 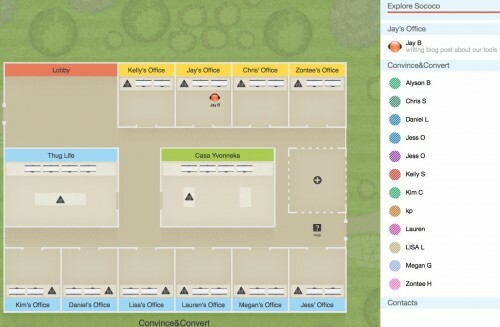 Sococo provides a virtual office layout that also includes IM, click to talk voice and video calls, status updates and more. It’s like an easier-to-use Skype with an office metaphor. Like Basecamp, but better (for us). Teamwork is our baby and our bible. It’s where all projects are set up, tasks and deadline are assigned, and files are stored. Anything we have due, for anybody, it’s in Teamwork. We particularly like the ability to assign multiple people to a particular task, and to create job templates that can be easily replicated (keynote speeches, for example, or the Social Pros podcast). We love these guys so much, they are a partner and sponsor now. CoSchedule is the editorial calendar we use to manage this blog and the 10 posts per week that appear here. Super easy to use, great way to work with guest contributors, and automated social when new blog posts go live. Garrett Moon and his team there are also incredibly easy to work with, and are always innovating. We’re lucky to have them in our corner. Not only am I a very proud investor in Buffer, I use it every day. I do all my content curation in Buffer, both on laptop and mobile, and it saves me a TON of time. I read more than 33 blogs routinely, and I just click posts I like, and Buffer sends them out in social throughout the day. It is the easiest-to-use social posting and scheduling tool, and the analytics available just keep getting better. Plus, the company has a remarkable blog of their own, and the team at Buffer is widely recognized as leading the charge toward business transparency world-wide. I love them. Period. For our team, this is the more collaborative side of our social posting and engagement program. I post all of my own content on Sprout Social, our publicity manager Lisa Loeffler also stages a lot of social posts in Sprout, and she also used it to run our nights/weekends program where we retweet/repost very popular posts each night and weekend day. I like Sprout so much that we routinely recommend it to big corporate clients, and they are the exclusive sponsor of my Jay Today video podcast. A remarkable combination of power and ease-of-use. Ready to have your mind blown? I was lucky enough to get into the beta group for Amy from x.ai which is an artificial intelligence robot that SCHEDULES MEETINGS FOR YOU! Seriously, this thing is a game-changer. Here’s how it works. You know how when you want to schedule a meeting or a call you have to go round and round with someone playing the options game? How about Wednesday at 2, 3, 6, or 9? etc. Amy fixes all that. You just cc Amy (the robot) on an email that says something like “Amy will work with you to get this scheduled” and the artificial intelligence engine will email back and forth with the person with whom you want to meet; figure out the right time; and put it on your calendar. We’ve been using it for a couple months now, and NOBODY can figure out it’s a robot. It’s that good. It’s scary good. Force of nature. These guys went from approximately zero customers to nearly two million customers in one year. How? By filling a need and doing it with crazy ease-of-use and a super low cost. Social media is almost entirely visual now, and Canva IS that trend in many ways. Facebook, Twitter, G+, Instagram graphics + a lot more. Everyone is a designer with Canva. 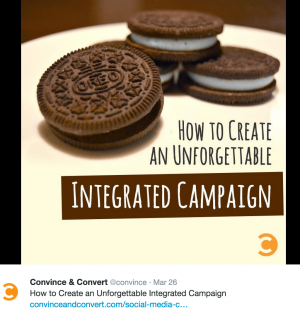 We use it to make the 10+ graphics we use every day to promote these blog posts and other stuff at Convince & Convert Media. This one is exclusively dedicated to the speaking side of our business, but it’s probably the most important one to me personally. Every plane ticket, hotel reservation, rental car, sound check, speech, restaurant reservation and more goes into TripIt, just by forwarding an email to plans@tripit.com. It totally organizes your entire travel life for you. Plus, the PRO version alerts you to flight changes and other real-time drama, usually before you hear about it from the airline or other company. If you travel even a modest amount and don’t have TripIt Pro (web and mobile) you are making your life way harder than it needs to be. Those are the nine we use most for time saving and collaboration. What do you use or like? Let me know on our Facebook page, Twitter, or beyond.